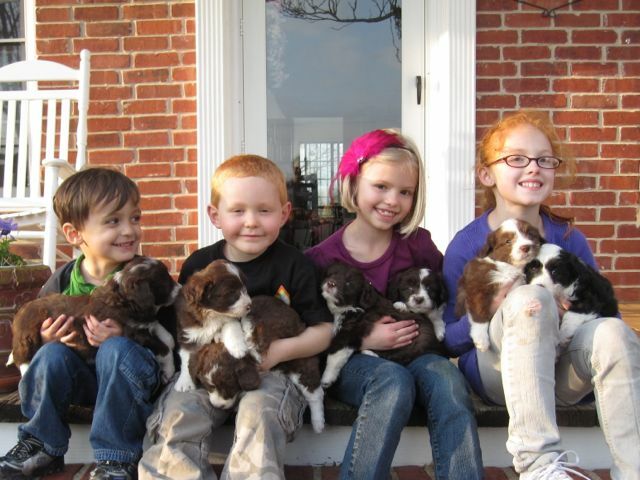 We require a $500 deposit to reserve a puppy. 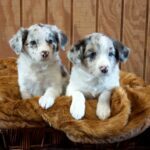 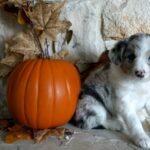 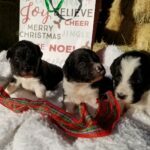 We have a variety of colors, see some examples of our previous litters below! 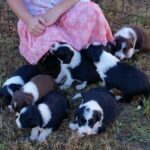 Fill out a puppy application for more info. 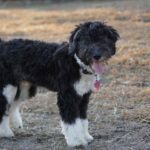 A Bordoodle is a cross of a Border Collie and Poodle. 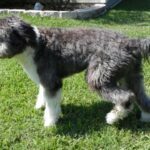 Adding Poodle to a Border Collie greatly reduces or even eliminates shedding. 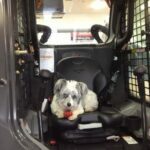 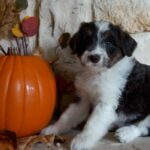 The Border Collie – Poodle cross is a great choice for people who fancy the attributes and intelligence of a Border Collie and want a non-shedding coat. 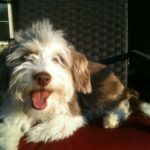 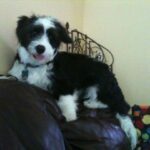 The cross is also known as Border Collie Poodle mix, Borderpoo, Bordoodle, Borderdoodle, Poodle Border Collie hybrid. 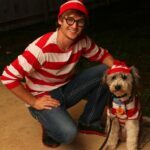 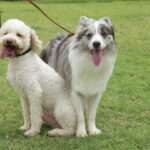 Any way you name it, the dogs are highly intelligent and great looking too! 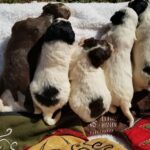 We bred the worlds first litter of Mini Bordoodles in 2010 and since then we have become more and more impressed with the quality of this cross. 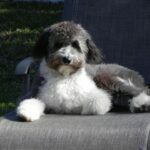 We owned, bred and showed a very competitive line of Border Collies for the 10 years prior to becoming Doodle breeders. 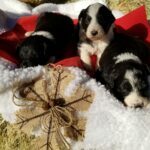 We absolutely love our Border Collies, but the shedding and the over the top drive to work all day was more than we wanted for our current lifestyle. 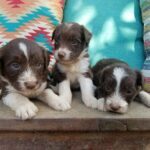 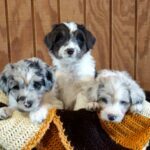 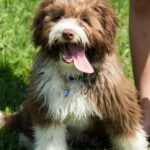 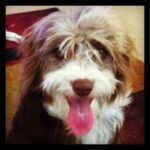 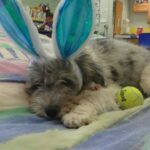 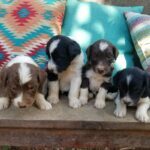 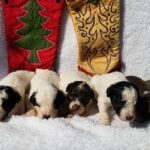 Our Borderdoodle puppies are doing very well in agility, as service dogs and as fun loving pets. 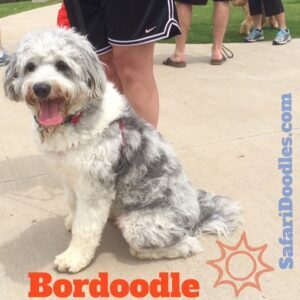 Feel free to contact us for more Bordoodle information. 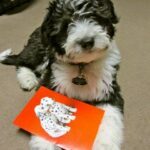 See our Facebook page for more Bordoodle pictures. Bordoodles we produced who are service dogs are: Pongo, Perdita, Bryce, Enndo, Gilbert, Sheldon, Castle, Leonard. 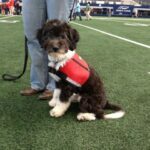 These bordoodles are trained for Diabetes Alert and PTSD. 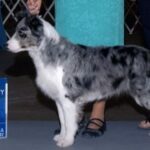 Pongo and Perdita were trained by AGS. 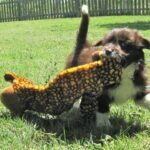 Bryce and Enndo trained by us, Safari Doodles. 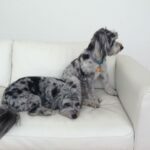 Sheldon, Castle, Leonard were trained by Power Paws. 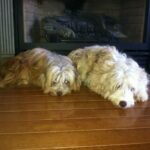 Plus, Power Paws did the final training and placement of Pongo & Perdita with the people that they lovingly serve. 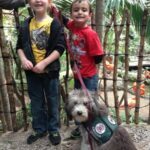 Enndo and Bryce will soon be available for matching with a person with Type 1 Diabetes through MADE in Texas Service dogs. 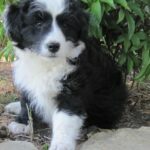 If you are looking for a DAD dog for a person who is hypo-glaucemic unaware, fill out our contact form and we will then get your info to MADE. 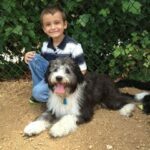 Watch this video of Sheldon showing how he learned to be a Diabetes Alert Dog. 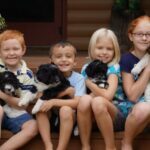 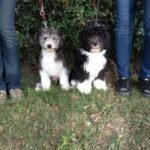 We mainly breed our co-owned/ co-bred top winning line of Border Collie girls to our Moyen Poodle, Dash Tevia for just a few litters per year. 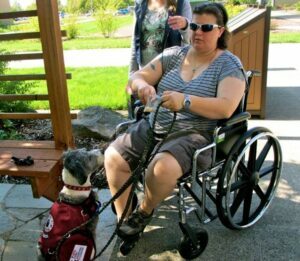 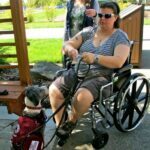 Our goal is to place these wonderful dogs in homes as service dogs, sport dogs or in active homes. 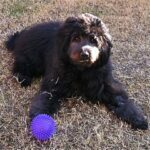 Bordoodles love to learn, love to play and are not ‘easy’. They are brilliant dogs, far smarter than Poodles and Border Collies. 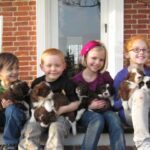 Due to this great blend of intelligence and drive, we only place our puppies in homes that are up for the challenge of this rewarding breed. 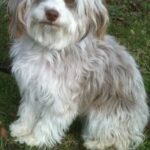 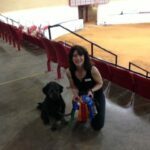 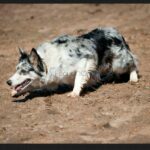 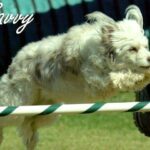 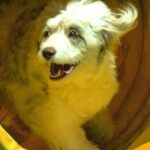 Are you looking for an Agility dog or Sport dog? 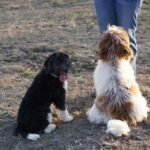 Bordoodle puppies have outstanding Volhard temperament test scores. 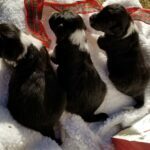 They have excellent drive for food, toys and attention. 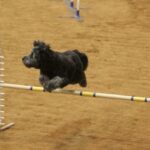 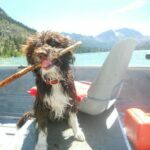 Most Bordoodles are super stable and would make an ideal sport competition dog, active pet or service dog. 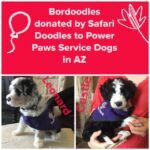 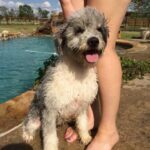 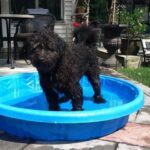 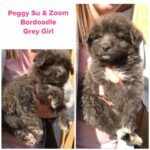 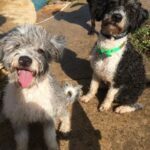 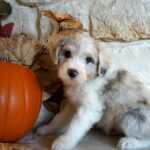 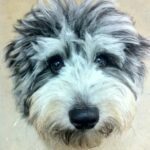 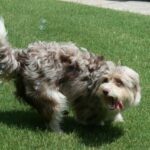 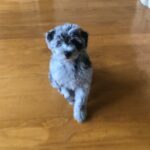 To see more info on Bordoodles we have produced, see our Bordoodle Puppy Videos, Videos of Agility Bordoodles and also visit the Safari Doodles Bordoodle Facebook page. 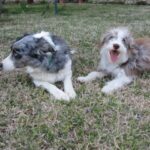 Our foundation line of Border Collies used in our Poodle and Border Collie cross are well known as competitive sport dogs across the world. 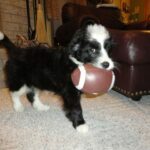 Our Bordoodles are bred with the dog sport competitor in mind. 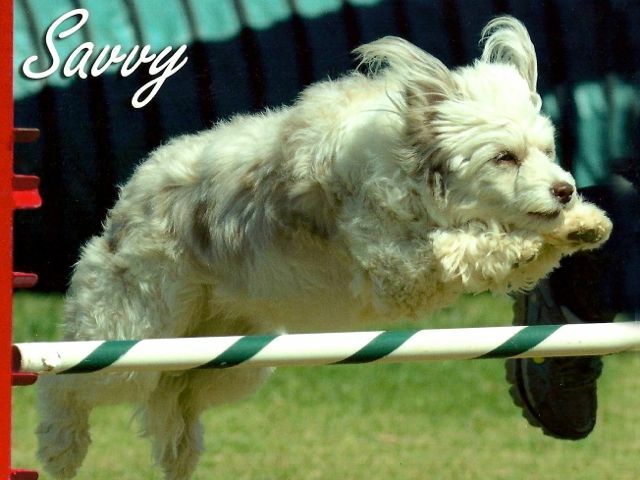 The parents are fully health tested and certified with OFA, CERF and DNA. 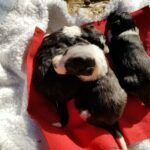 This helps ensure you are getting the very best bred puppy possible. 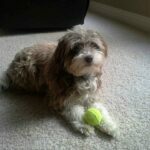 We give a 2 year health guaranty. 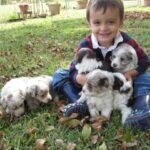 Puppies come to you up-to-date on shots & deworming, vet checked, raised by the “Super Puppy” method using ENS for the first two weeks, Volhard Temperament tested for a perfect placement, fed Life’s Abundance super premium dog food and NuVet Plus supplement, Micro chipped with Home Again, imprinted to eliminate in the litter box plus use the dog door and potty on the grass, super socialized with children, raised in the house and pre-spoiled. 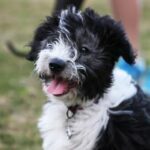 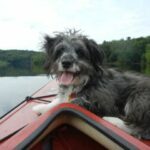 Borderdoodles are a second name for the Poodle and Border Collie mix. 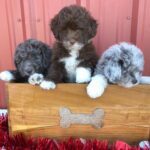 We specialize in mini and medium size Bordoodles. 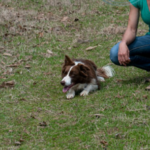 The mini ranging in size from 15″-18″ tall and 18-25 pounds as adults. 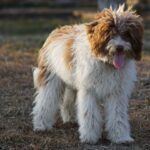 The medium size Bordoodles range from 17″-20″ tall and 25-45 lbs. 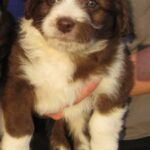 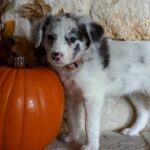 We breed our well known and competitive line of Border Collies to mini and Moyen size Poodles. Moyen Poodles are also known as Klein Poodles. 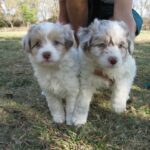 It is a recognized size of poodle between the Mini and Standard size Poodles. 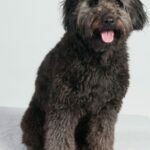 In Europe this Moyen/ Klein Poodle is shown in its own size class. 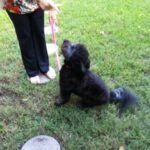 In the US the AKC does not recognize this size of Poodle in the show ring. 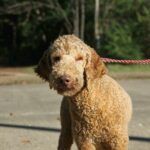 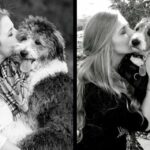 The Moyen Poodles are gaining popularity in the US. 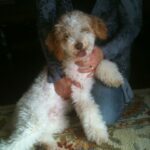 Our stud dog Dash Tevia is a Moyen Poodle. 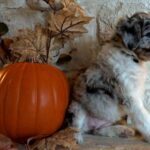 He is an apricot parti colored boy, weighing 20 pounds and 17″ tall.